His work both deserves and requires serious consideration and evaluation. This study analyzes the transformation of German Jewry in the period from 1780-1840 in order to explain why the nature of the most visible Jewry in modern Europe remained essentially invisible to its own members and to subsequent generations. German Jewry was the most visible of the modern European Jewries because in its history all of the hallmarks of modernity seemed to have converged in their fullest and most volatile forms. 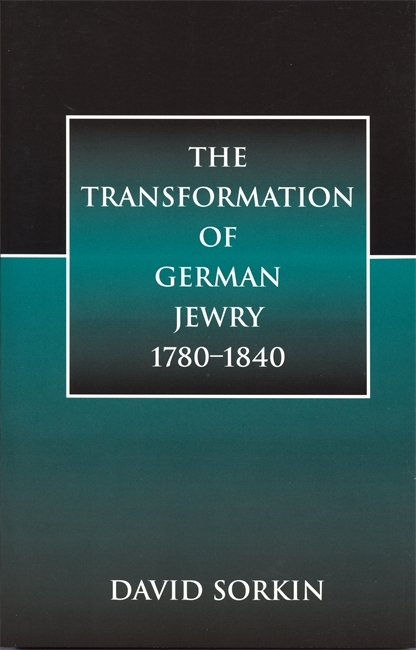 The Transformation of German Jewry 1780-1840 thoroughly explores this period of time when large numbers of Jews were integrated into a non-Jewish society. Sorkin examines the revolution of German Jewry through the study of journals, sermons, novels, and theological popularizations that constituted this new German-Jewish "public sphere." This study may also be applied beyond the confines of Jewish history, for it is a study in the afterlife of the German Enlightenment, the Aufklärung, in the culture of liberalism. David Sorkin is Frances and Laurence Weinstein Professor of Jewish Studies at the University of Wisconsin-Madison. He is the co-editor of Profiles in Diversity: Jews in a Changing Europe, 1750Ð1870 (Wayne State University Press, 1998), and author of Moses Mendelssohn and the Religious Enlightenment (University of California Press, 1996). This book is surely one of the most challenging, thought-provoking and indeed brilliant among recent studies in modern Jewish history. In an original and profound manner, David Sorkin has reconceptualized the critical period during which German Jews in significant numbers first integrated into non-Jewish society. He has provided a distinctly new way of understanding that process. His work both deserves and requires serious consideration and evaluation. [Sorkin] has a subtlety of insight and a novelty of approach which makes what he has to say new and compelling.